Is this the loving God of the Bible?? This is a perfect example of a "Cliche" gospel presentation that may damn a soul to hell. After all the good information he gives he says that "you must ask Jesus to save you," and you must "really mean it." Where in the Bible did a lost person ever pray and ask Jesus to save him?" Notice that he is saved if he "meant" his prayer. 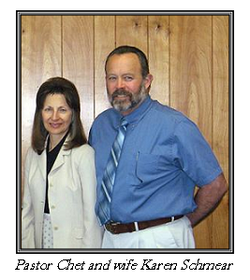 Chester Schmear is the surviving co-founder and Pastor of Good News Messengers Church in Milwaukee, WI.